Childhood obesity is on the rise along with risk factors for heart disease. Many children now have to combat Type 2 Diabetes due to the sedentary lifestyles (technology) they have become accustomed to in our modern day era. Generation Exercise will become a welcomed family resource and guideline to assist parents with maintaining a healthy lifestyle for their children. This reference guide gives simple approaches to exercise, nutrition, dieting, sleep, hydration, habits, sports and much more. Healthy living is beneficial for kids and adults of all abilities! The key is determining what you and your family can add to your daily routine in order to create a healthier life. Managing stress, exercise and/or daily movement can increase both your physical and mental well-being. People of all ages and abilities can benefit from living a healthier lifestyle, and Generation Exercise is the perfect book for anyone who is interested in changing and adapting your current daily routine. Many children lead sedentary lifestyles in this era of technology. Learn unique suggestions to get your kids up and moving on a regular basis. This chapter will discuss the importance of complex carbohydrates, plant proteins and unsaturated fats. Examples of healthy after schools snacks will also be given. Does your child get enough sleep? Homework and technology may keep them up later than they should stay awake. Read about why proper sleep is important. The importance of getting your child involved in sports from the physical and social aspects. Discussion will also take place about find the right sport for your child. Most children do not hydrate properly. This chapter will discuss how much water your child should consume each day as well as the importance of hydration in their diet. Technology versus physical activity....which is winning? Suggestions on what you can do to reduce technology in your child's life while increasing their physical activity. 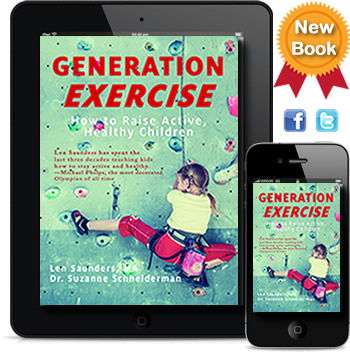 Generation Exercise is a great resource for any parent or grandparent! I highly recommend it to teachers as well. For over 30 years, Len Saunders has helped families lead healthy lifestyles through his books, workshops and programs. As a parent, I was excited to read this book and share valuable information with my kids about fitness and nutrition. Use social media and email to spread the word about this new book. 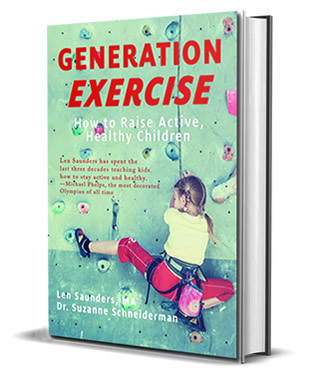 The book Generation Exercise teaches your children the proper fundamentals of sports, fitness and exercise. Parents and children will gain more insight to proper nutrition and health. Examples of healthy meals and snacks will be included in this book. Suggestions will be given on how to stay healthy as a family, including proper sleep, hydration, and team sport concepts. Teach your children healthy habits at a young age that will last a lifetime. Len is an award-winning, best-selling author and a motivational speaker in the fight against childhood obesity. 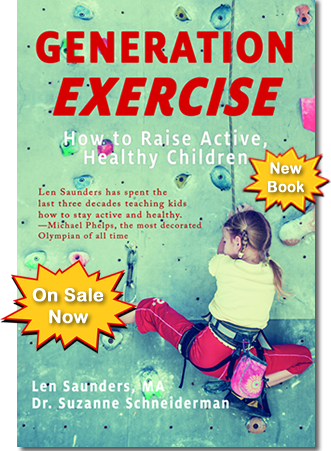 Generation Exerise will be Len's 8th book that he has published. He is recognized nationally for his innovative wellness events. Recently, you may have seen Len on such media giants as CNN, Good Morning America, CNBC, The Today Show, ESPN, Nickelodeon, MSNBC, The Fox Channel as well as the front page of The Wall Street Journal. Len has served as a consultant to the President's Council on Fitness, Sports and Nutrition as well as a spokesperson for the American Heart Association on the topic of childhood obesity. 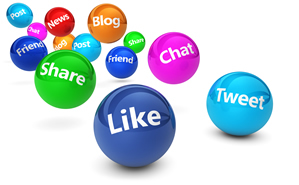 He has written articles for various media outlets including US News & World Report, Sports Illustrated for Kids, FOX News, MSN, AOL, PBS, Muscle & Fitness, USA Today, Working Mother, The National Wildlife Federation, Sports Illustrated and Yahoo. Recently, Len worked with The New York Times Company as an expert in the field of children's health. Dr. Suzanne Schneiderman, OTD, OTR has been a practicing occupational therapist for over 20 years. She received a Bachelor’s Degree in Biology from Binghamton University, Master’s Degree in Occupational Therapy from Touro College, and Doctor of Occupational Therapy from Loma Linda University. Dr. Schneiderman has worked with individuals and their families in all different settings throughout the lifespan, including children birth through three years, adolescents, adults and older adults in hospital, home, community and school settings. Currently, she is working with children in public schools, home, and community settings. She enjoys traveling and spending time with her husband Ari and her children, Sara and Scott. Dr. Schneiderman has been thrilled to be part of this project!